Need to create elearning courses? We’re here for you. We work with your subject matter experts to create engaging elearning courses on any topic, design them to fit your corporate brand, and integrate them with your learning management system. To see who we’ve worked for and what they thought, scroll down. Wanna see some work samples? Check out our portfolio. 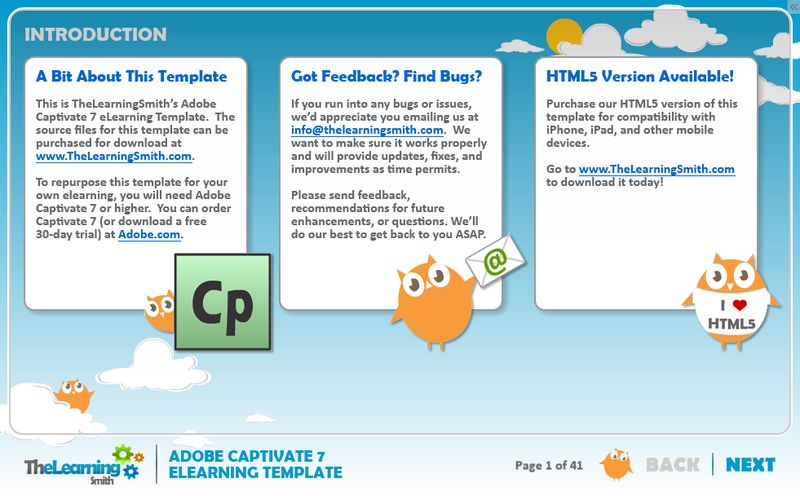 We create some pretty awesome elearning (if we do say so ourselves), but don’t just take our word for it. Read some of the nice things that others had to say about us. "I am very fortunate to have teamed up with Dustin to create e-learning content for Pentair’s global enterprise. Dustin is a rare talent who quickly grasped the ideas of lean and strategy in a holistic way and still payed attention to minor details. He combined creativity and a ‘can-do’ attitude that delivered exceptional e-learning — he has my highest recommendation." "Dustin has produced some of the most professional trainings I have seen in my 35+ years in Operations. His work is very user friendly and widely accepted by all those that have used it for their site trainings. He has a keen understanding of the Lean/Operations Excellence process and develops tools that make it easy for the executives, site leaders and site associates to use and understand. I would recommend his services for anyone who is looking to develop eLearnings and training tools for your Lean Transformations. He is the best!" "Dustin is very customer focused, assuring he understands the VOC and what the expected deliverable is required to accomplish. He is driving toward the end goal, but never comes across as forcing something to happen or compromise the results for the sake of the time table. He delivered the product, on time and with excellent results. He is very open to criticism and feedback as well as offering advise on how to achieve better results with a different approach." "Dustin is very creative and I was very impressed with how he was able to create a online training course for my department with the information that we provided to him. The course has been a success for my team!" "Dustin is a creative and resourceful leader that continues to execute a pace that far exceeds expectations. Dustin is not only delightful to work with, but has a natural energy that draws others in. Dustin has been a partner and a leader throughout his time working with me. I highly recommend Dustin to any leader that is looking for someone to help them drive for great results, find new ways of accomplishing difficult tasks and to create great partnerships throughout the process." "Dustin has a thirst for innovation, curiosity, and efficiency. In my time at Target, he taught me that ‘it’s not about having all the resources- it’s about being resourceful’…. a philosophy that I now live by. He taught me to always ask ‘is there a better way?’. He helped me learn pretty much everything I know about eLearning design and development. Dustin is smart, patient, and passionate about the work he does. Overall, he’s a great guy that I had alot of fun working with (and learning from)." "The most helpful thing I can tell prospective clients about the LearningSmith is this: They aren’t a typical contractor/consultant/outsourcing agency. They have become an extension of our IT and Marketing teams. We have partnered with the LearningSmith on several mobile app development projects and could not be more pleased with the results. From kick-off to go-live the projects were excellently managed and executed. The LearningSmith not only delivered on-time, they also trained my staff along the way and added several key insights and design points that made the end product even better than we had originally designed." 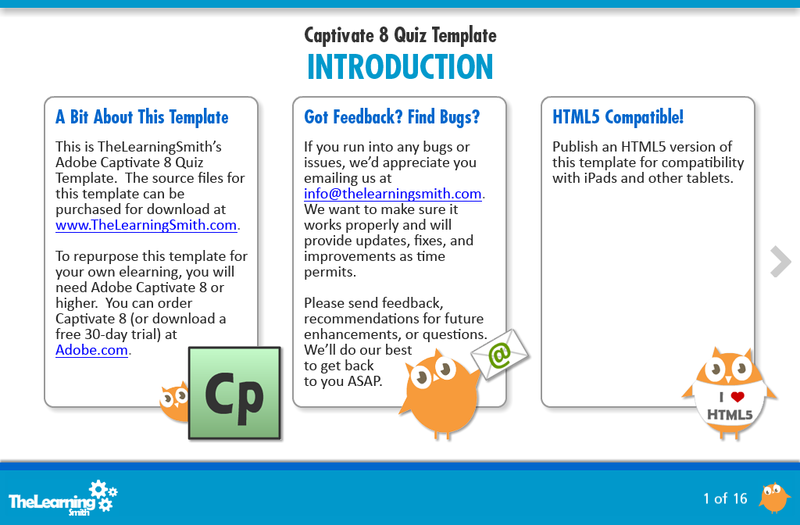 Interested in creating your own elearning courses? We can help with that too. 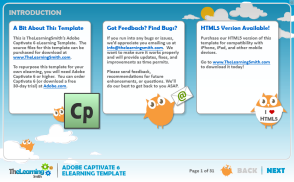 We offer multiple templates and tools to help you learn how to design and develop elearning courses using the most widely-used tool in the industry, Adobe Captivate. 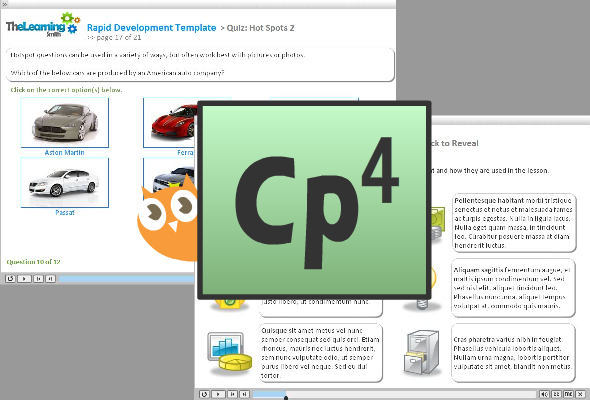 Purchase a template below and check-out our Adobe Captivate 7 video tutorials.